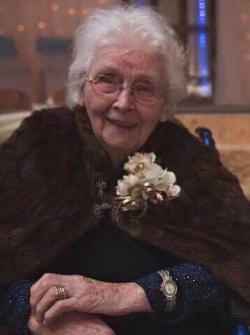 BURLOCK, Marjorie Somerville , a 61 year resident of Bristol, New Brunswick, was promoted to "glory" on Monday, April 01, 2019. She is survived by her children; Ellen Virgint and husband Douglas, Della DeMerchant and husband Richard, Hazen Allison Burlock Jr. and wife Sandra, Jeffrey Oland Burlock and wife Tammy. She is also survived by ten grandchildren, Daniel and Marilyn (Cadotte) Virgint, Lance, Aaron and Sara (Quarin) DeMerchant), Benjamin and Alexander Burlock and Timothy, Jillian (Melanson) Burlock, Rebekah (Dickson) Burlock and Nathaniel Burlock. Mrs. Burlock was blessed to have 15 great grandchildren; Jenny, Jake, Madison, Makayla, Morgan, Katie, Austin, Baylee, Isaac, Eliana, Micah, Jameson, Kylie, and Rose Marjorie-Lynn. Marjorie Burlock was born in Mt. Pleasant, New Brunswick on January 09, 1924 and. predeceased by her husband, the Rev. Hazen Burlock, and brother Oland Somerville. Mrs. Burlock was a faithful Christian, loving wife, caring grandmother, and a selfless servant to others.